Assembled according to instructions, but some parts are still a bit "loose", i.e. they shake a bit. Apart from that, very high quality product. Finnlo Tricon is very solid and stable. I am 170 cm tall and my weight is 65 Kg, for me it is perfect: I didn't find any disadvantage. The cushions are very confortable as well as the support for the fees.I am very satisfied. Great article and good quality. works well. Adds to the value of the pull up bar by giving additional exercise options. May not last long as I've used ab straps in the past that are a little thicker material. But that will be determined over time. Abs and back machines are the ideal machines for strengthening your core. Strong trunk and lumbar vertebra muscles increase the performance in daily life and prevent back pain as well as back problems. At the same time, reinforced back and abs muscles provide an improved posture. Muscle parts, which are difficult to train with multi-gyms, can be especially demanded with abs and back machines. It makes them a practical addition to your training. One-sided activities like working at a desk or the lack of movement in daily life also cause the reduction of trunk muscles. Prevent it with a special core training. Abs and back machines are available as combined machines or single ones. Purchasing one, you should bear the question in mind, which exercises you want to do with the machine. The quality of used materials and the connection of single components need to be considered so that your Abs and back machine offers a safe stability. That's the same for welding seams of the machines, which need to be of neat and clear workmanship. A bigger set-up space and a high weight stand for a higher stability of the abs and back machines. Most abs and back machines can be folded and stored space-efficiently after the training. This training equipment can also be used as weight bench for light dumbbell training. "Abs machines" is the general term for summarizing different versions of abs training. Besides the classic sit-up benches, the so-called ab roller or wheel exerciser are also part of abs training. Using an Ab Roller, you lie on the back and the device supports you by giving the correct posture and course of motion. It protects sustainably your spine. The Wheel Exerciser are smooth running double wheels with non-slip handles at the end of the rollers. You are on your knees doing the exercises and roll forwards with the Wheel Exerciser in your hands so that you are in an almost horizontal position. Do different abs exercises with these products and creat your training even more successful. Wheel Exercisers are not suitable for training beginners, because the movement demands a high level of muscle coordination. They are perfect for advanced training and also suitable for use on holiday due to their small size. Hyperextension are effective training devices for training lower back muscles and gluteal muscles. Many models offer you the possibility to adjust the incline angle of the pelvis upholstery and the footrest. ind effektive Trainingsgeräte zum Trainieren der unteren Rückenmuskulatur und des Gesäßes. The degree of difficulty and intensity of the training depend upon the angle adjustment of the hyperextension and can be adjusted to the need of the user. Purchasing a hyperextension, you should pay attention to a divided pelvis upholstery for more comfort and ergonomics. This machine combines the advantages of an abs machine with those of a back machine. Those offer you a large selection of different exercises to do a varied training. 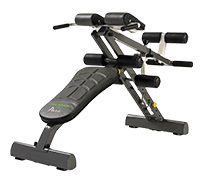 An abs and back machine includes a classic sit-up bench or training bench, which is adjustable in the incline angle. In addition, an abs and back machine makes it possible to train the lumbar vertebra and gluteal muscles like on a hyperextension. For a more effective and more varied training we recommend you to add the use of resistance tubes or weight plates. Thus you can set new training stimuli and increase the intensity of the training if required. While exercising with the back machine you just press a weight plate on your chest. Due to the higher weight, your lumbar vertebra zone is stronger demanded. The resistance tubes can be attached to the hyperextension and can also be used for additional resistance. Which abs and back machine is the right one for me? Ask our expert team! Our expert team gives you best advice regarding all questions about fitness. Our committed service team of experienced fitness coaches, sports scientists, and salesmen is happy to give you advice for purchasing an abs and back machine - in order to find the machine which meets your requirements optimally. Either by phone, email or on site at one of our several stores - we are there for you.